Provides a healthy alternative reward for your pet bird to enjoy. Seed, nut & fruit bar which is protein and vitamin enriched. Contains added calcium to help maintain strong beaks and claws. 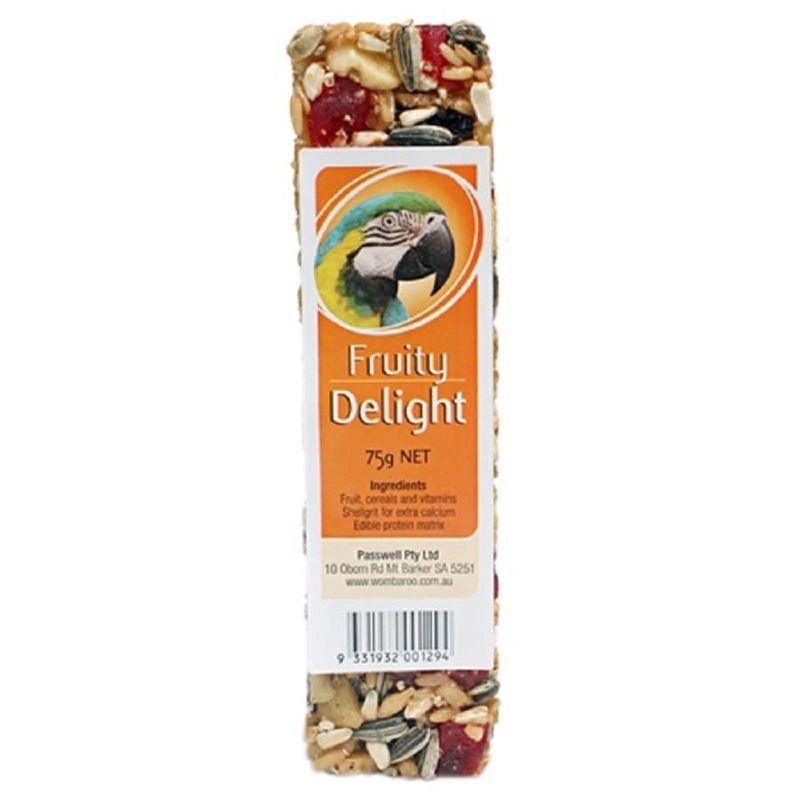 Full of nutritious seeds with added fruit providing parrots and similar birds with essential vitamins and minerals even during play time. Easily hung inside your bird’s cage with the wire provided. Ingredients: Hulled Oats. Sunflower. Safflower. Sorghum. Corn. Japanese Millet. Shirohie Millet. French White Millet. Canola Seed. Linseed. Paw Paw. Peanuts. Almonds. Banana. Vegetable Oils. Shell Grit. Gelatine. Citric Acid. Vitamins & Minerals. Seasonal variation in ingredients may occur. Wombaroo Food Products was founded by Brian & Roslyn Rich. In 1976 they established a research laboratory to investigate the nutritional and energetic requirements of native birds, in particular honeyeaters and lorikeets. This ground-breaking work led to the foundation of Wombaroo Food Products in 1984. In 1987 Colin Rich joined the company. His expertise as an ornithologist and aviculturist was instrumental in the introduction of the Passwell range of bird foods. Their Lorikeet & Honeyeater Food, Insectivore Rearing Mix, Finch Soft Food and Parrot Pellets & Crumbles are used extensively as maintenance diets at institutions such as Taronga Zoo, Adelaide Zoo, Currumbin Bird Park, Gorge Wildlife Park, Territory Wildlife Park, Healesville Sanctuary, Department of Conservation and local councils.